In today’s Kummatti is also a good and a safe place for families. Kummatti`s oldest departments renovations has improved our level of living substantially. Our renovated departments have colorful exterior surfaces, glazed balconies, and a fully renovated interiors and also the common rooms with various fittings, and a play yard equipments. 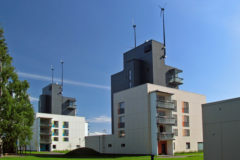 Presentation of Kiinteistö Oy Kummatti`s rental apartments can be found here pdf.